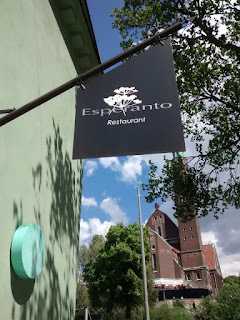 So, keeping most of the details reserved for my very own self, I had the chance to do an internship in the Michelin starred restaurant Esperanto located in a cool old theatre building that is also the home of the other restaurants of Esperanto group in Östermalm district of Stockholm. It is the base establishment of one of the Swedish star-chefs, Sayan Isaksson. Esperanto team is lucky to be able to work close to such an inspirational leader, Sören Polonius, one of the most famous Swedish wine professionals and for sure many people as me -and again for sure not only me- seeing him as an inspiration. I got so much inspiration and ideas that I am so excited to set all these ideas at my work place and my own daily schedule. Today I am training the staff in the restaurant I work and I can easily say that I got a huge inspiration from Sören Polonius, how he takes his job&position and how he works with his colleagues. Now today I try to give the best of all I know to my colleagues and will do that in future too, this is something I got from Sören, the importance of leadership and aim of perfection. As Sören said one day during one of our discussions, "Deniz, I have to push myself to perfection professionally, if I would be a leader and as a leader I would not push myself, why would the rest of the team do then?" While working there, I was impressed how the whole restaurant functions like an organism itself, everybody knows what they are doing, what situation they are in and how they should handle things. During a usual work day in Esperanto, sometimes Sören is the first one walking in very early in the morning and getting ready for a SweSomm training or a producer meeting or a tasting. And then the Esperanto team starts coming in one by one and get their hands on work. Meanwhile bookings are done, also Facebook and Instagram accounts are actively being updated. A simple fact that internet exists in our lives right? And Sören uses it a lot. He was even surprised and rebuked me in a funny way to get an Instagram account as soon as possible, so I listened to the big boss and I did get an Instagram account asap :) I have to say, it was super interesting to see super serious, sharp and systematic SweSomm trainings. I am so grateful to you Sören for inviting me to all the trainings and showing me your methods. One of the tastings during the week, Champagne Palmer&Co. It was nice to see Raymond again just after we met in Helsinki couple of weeks ago. Of course, since I write this wine blog and since I am next to a star professional, I had to ask him to sit down with me for an interview. We clearly see in this interview that it is very important when you have an employer supporting you with your educations and competitions in both mental and financial cases. And to add, family support for a real-pro-sommelier, husband/wife/boyfriend/girlfriend support is crucial. After already working couple of days together, through the end of the week, I had the chance to film an interview and finally I had the time to write it here, Enjoy! Deniz- Finally Sören, we sit down together :) I have few simple basic questions, some might sound even funny or cliche. D-For example who is Sören Polonius and did you always want to be become a sommelier or as many sommeliers tell such a story like "Well I was hanging around in the restaurant and working on the floor and by chance I became a sommelier" kind of a thing? S-Well, to start with, I hated wine when I was younger (we laugh), I was a bit of a troublesome child, at the age of 14, we burglarised my gymnastic teacher's wine cellar (laughing as he remembers), I drank myself so much of it that I became really sick, and after that it took me like forever to look after wines again and I wasn't really happy about it. Then I started to think like "Hey I kind of like wine" and that was a few years after. Working in restaurants, I discovered that all friends that I have been working with, they were always pushing me to the table if the guest was talking about wine because I did talk a lot about wine and was really interested in it. It took quite a few years because I left Sweden, I went to Cyprus. S-Well, That was a completely different life, In cyprus, I lived almost like 3 years. I was the activity guide for Vingresor, at max their specific, pub crawls, bungee jumpings with the guests and so on. That was about 1994, so I kind of left restaurant business for a while like a young kid traveling and having fun. And after few years later I came back home. When I came back, I ended up in Uppsala, and worked in a place that is like a normal place before the sommeliers really started to show up in the restaurant scene. There I was the person who immediately started to take care of the wines, following, ordering, without any specific knowledge. The place bankrupted, and then I went to Japan for 3 months and worked in a bar, when I came home after that, that was when it all happened, I ended up in that fish restaurant called Hambergs Fisk, they gave me the sommelier education, that was 1997. D-Did they send you to a course? S-They send me to the restaurant academy and gave me the money to finance the education. I graduated "number one" in my class and I started to compete immediately and all these. I wanted to become a member of the sommelier association before I finish the school, I did all the tests and managed to do it, so I was in the sommelier association before I finish the school. 2003 I got in the 4th place in Swedish championship as a first time as a competitor, I gave a really good test and so on, I got into the competition track like this and did that for another year, just looking at the trade and scouting the whole thing, the 3rd year I got a decision, I said "Ok I am gonna do something serious about it" and I ended up in the final, there were 4 people in the finals, other people were my old teachers, and in order to come to Nordics, I needed to come to the 2nd or 3rd place, because Andreas Larsson was there and if he won the first place, he already won the Nordics so he was not allowed to go there, so that meant that I had to beat one of my teachers so I did. Then I went to Iceland to compete. I guess that was the first time I competed against Samuil Angelov, I came 3rd at the final, the following year I won my first Swedish championship. I took a break after. Oh by the way, after Hambergs Fisk I went to work for Mathias Dalhgren, that was a bit of a lucky shot, because that was 2004 or 2005, I started to work there as a waiter, from no where, no knowledge, no fame, and I started to sell some really good stuff that sommeliers didn't even care to sell, so they asked me to have a meeting, and then in the meeting they asked if I would like to be one of the sommeliers in the sommelier team that they are about to build up. I said "Yes!" and it was such an opportunity as a young boy, and we did that two years until it closed down, 4 hours later as totally strange, Melker Andersson called me and told me that they wanted to have me for F12 Group. I started working with them and that took about 8-9 years, and then when they closed down F12, I also left the group and I moved to USA for a month renting a house just to move away of everything and take a break. But then Sayan contacted me, I met the ex-restaurant manager, they were also in Napa at the same time I was, we just met briefly, that was about 3 years ago, we had some discussions and interviewed each other, and I discovered what I want to do with this team. So we built it up and we are very happy and lucky to work with a really good team like we have today. This is pretty much where I come from and what I do for Esperanto. I have my own company that I do on the side, I do all the lecturing myself, I run SweSomm (Swedish National Sommelier Team), and I have my family as well. D-And you also teach in the academy? S-Yes but that is a part of my own company business too. D-Which restaurants you worked so far all together? S-Hambergs Fisk, Bon Lloc, F12 Group sommelier, Esperanto. D- You also did internships in States right? S-Yes, just like you are doing here with us, I went to States to work with Thomas Keller and the sommelier team in Restaurant Per Se. Because we were preparing for a guestplay by Thomas Keller in F12. That was the first time he ever did anything with a full menu outside the US. That took a preparation of 8 months. At some point we had to go there and meet people and discuss the project etc. And for my own company, I do travelling around the world, teaching people how to compete, how to lecture, how to become and be a sommelier. S-That would be so easy to say good wines and cigars! (Laughing) But, I think, it is being really focused on the task, that means that never ever stop and feel how you feel. Whatever happens. That might mean that you run into a wall and hit but you might just keep on going. Its like when you are running downhill, and you get faster and faster and you can't really stop, that is what I am right now, because if I try to stop, I am afraid things might go wrong there. Esperanto is the place I do specific hours of work every week, month, year. But sometimes I spend more time with my family, sometimes I say "no" to quite a lot of assignments just to be with my family, sometimes there are assignments that I really think that I should take, and I am trying to give SweSomm as much of my spare time as possible as well. So the thing is, which makes me think that all these work together, I don't see my life as divided into parts, I think everything kind of sticks together and everything is making up the person that I am today. I would probably find it really difficult to exist without one of these puzzles. D-And I guess also the fact that your wife is a sommelier too, that has a big part in how things just roll right on their way!? S-Yes she understands what I am doing, of course she wants to see me a bit more but she understands. She knows that I would probably have difficulties to exist in a proper way if I didn't have this kind of a tempo of doing these. I think it is also very important when the brain is working like an engine, just don't try to stop it, work with it. D-Who are your most important supporters among the sommeliers both in Sweden and around the world, like who do you call when you need to ask something? S- Well my team would be the foremost support probably. Both Esperanto and national team/SweSomm. If I have a serious, private, almost personal level question about wine, of course Arvid, who became a very good friend of mine, Andreas to some extend, well he is travelling around so it is difficult to reach him sometimes, but we are good friends. There are also sommeliers all around the world that I have more contact with than others, non mention non forgotten, like there are people in New York that I am emailing with and they email me too whenever they need me, and some more, depending on the issue, I know the specific person to contact. D-What are the roles you take in national and global competitions? S-Well in Global competitions, as the head of SweSomm, we are in a position that, since I have trained Arvid and Andreas, which means training two European gold medals and two World Champiaonship golds, put me in a kind of position, I think it was the Estonians who said "These two guys are the best sommeliers in the world, they won European and World Championships once, but you as a trainer you won European And World twice, you are the best trainer in the world." However I have to say that there are a lot of other really really good trainers, but I was just lucky to have two good sommeliers to work with, Andreas and Arvid. We might see some more now coming up with Fredrik and so on. D-You trained Arvid, what was the most challenging thing when you train a world champion-to be? S-Is to understand that he is going to be so much better than I am (he laughs very hard :) Thats for the ego thing :D When I discovered that Arvid going to be so much more better than I ever been, that was like first punching me in the ego but i came over it and then really pushed him forward and that was probably the most difficult thing. And then to be able to train these guys, I have to be up to the level where they are, I can not just be a normal nobody. D- My next and the last question, there is something like a brand building, there something called SweSomm, do you agree? And what it takes to create the brand "Swedish Sommelier"? S- First of all, you have to get the champions, like Arvid and others, they attracted a lot of attention when they won, and when my guys are winning nationally, and Nordics and so on, it attracts attention from winemakers, importers, journalists, wine people all over the world. And we used Facebook and Instagram as really good tools. So yes, long story short, that was it. 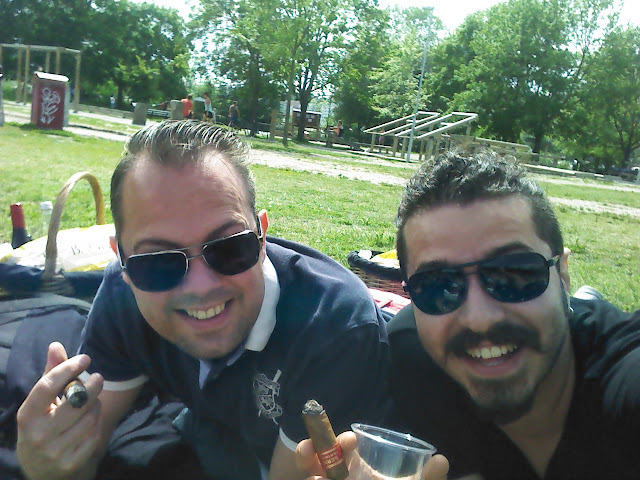 The last day of my internship, with the whole team, we all went to have a picnic and I also had the chance to have a cigar&wine pairing session with Sören on a beautiful sunny Sunday and personally I would like to say, with all the experience and generosity of ideas and training methods you showed me, THANK YOU SÖREN. I am lucky to have such a professional friend like you. See you soon in Helsinki during Nordics and we will see more soon in future. May your glasses be filled with fine wines with great friends around. Now I am back to work to pour some wine, check cellars, guide the staff and run a service in the restaurant with my colleagues. I attended a few company events here and I must say that I was impressed every time. The event space Atlanta was aesthetically pleasing with very good decorations and seats. The place had a great layout overall, and was at a comfortable temperature.